You know the smell: wetsuit funk. It’s not pretty, but it is preventable—and so is the chlorine and salt damage that shortens the life of your expensive neoprene gear. 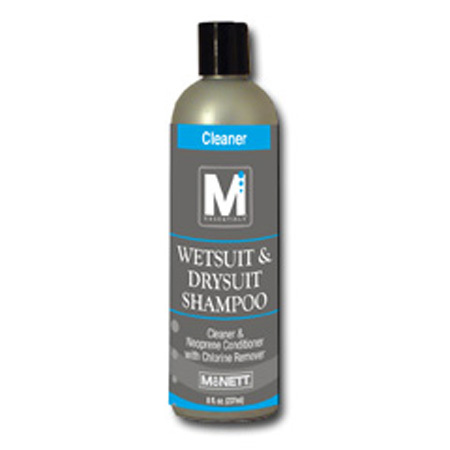 Just use Wetsuit and Drysuit Shampoo by M Essentials™ on booties, gloves, fishing waders, LYCRA® body wear, and of course, wetsuits and drysuits. Our Wetsuit and Drysuit Shampoo works fast to remove organic residues like algae and bacteria, plus chlorine and salt deposits—so your neoprene gear smells fresher, stays supple and lasts much longer. Preventing your own premature aging isn’t easy, but for your favorite watersports gear, M Essentials makes it a snap—with our Wetsuit and Drysuit Shampoo. Remember, cleaning wetsuits means less funk and more fun.